Democratic socialist Rep. Alexandria Ocasio-Cortez (D-NY) has proposed a solution to her 2.5 million followers on Instagram that can help delay the end of the world she is expecting in 12 years from climate change - stop having kids! Ocasio-Cortez has often used alarmist language when discussing climate change, repeatedly comparing fighting climate change to fighting Nazi Germany and has gone as far as to claim that the world is going to end in 12 years if her far-left policies are not implemented. It's not surprising that Ocasio-Cortez has joined the overpopulation bandwagon but the propaganda will only work on the masses for a few more years before the mathematical reality will render it impossible to believe anymore. But this has not stopped a number of individuals who believe stopping large families is the answer to solving overpopulation and thus slowing our carbon footprint. Enter Bill Nye the Propaganda Guy our used-to-be friendly, bow-tie-wearing rabid anthropogenic climate change pusher, who is now casually discussing with bioethicists on his show how people should maybe be punished for having "extra kids." Nye previously asked one of his panelists on his Netflix show "Bill Nye Saves The Earth" if it would be a good idea to have the government penalize having "extra kids." "Should we have policies that penalize people for having extra kids in the developed world?" Nye asked Travis Rieder, an academic for Berman Institute of Bioethics at Johns Hopkins University. "I do think we should at least consider it," said Rieder, who believes that limiting the size of families is paramount to fighting global warming. "Well, 'at least consider it' is like, 'do it,'" Nye stated. One might wonder what exactly is meant by an "extra kid"? The type of penalization Nye is talking about is likely the financial kind that "taxes" extra kids in the name of saving the environment. This is not the first time the idea of penalizing "extra kids" has been proposed by those in the environmental movement. A democrat congressional candidate in Pennsylvania last year also proposed to tax parents who have more than two children as "irresponsible breeders." Scott Wallace is a population control zealot who has donated over $7 million to population control groups. Wallace is also supported and endorsed by both Planned Parenthood and NOW (National Organization for Women). According to The Daily Wire, Wallace, a millionaire and democrat who believes in taxing families with more than two kids for being privileged, also believes that the tax would be on "the privilege of irresponsible breeding." Between 1997 and 2003, Wallace gave $420,000 to Zero Population Growth (ZPG) -- now Population Connection -- an organization co-founded by "Population Bomb" author Paul Ehrlich, Fox News reported. From before its inception, ZPG had announced its intentions to tax large families for the "privilege of irresponsible breeding." A 1968 brochure advocated abortion to stabilize population growth and claimed that "no responsible family should have more than two children." Therefore, "irresponsible people who have more than two children should be taxed to the hilt for the privilege of irresponsible breeding." Wallace's fund (Wallace Global Fund) also gave $20,000 to the Center for the Advancement of the Steady State Economy (CASSE) in 2010. CASSE is an environmentalist group that sees economic growth as undesirable. The group supports an economy with "stable or mildly fluctuating levels" and a society with equal birth and death rates. CASSE calls this stagnant state of affairs "maturing." CASSE still supports zero population growth and executive board member Herman Daly has pushed for reproduction licenses (permission from the government to have children). This bureaucratic control over birth would allow women to have only two children unless they buy the license for more children from other women who do not reproduce. Daly called this program the "best plan yet offered" to limit population growth. However, if we can't stop them with taxes then let's promote saving the environment through abortion. In a keynote speech at Planned Parenthood last year, radical feminist Gloria Steinem somehow succeeded in linking abortion with climate change in a way that is both anti-human and deeply disturbing. According to Steinem, "Forced childbirth is the single biggest cause of global warming". For Steinem, not only is protecting the right of a woman's unborn fetus now a "forced childbirth", but it is the single greatest catalyst for global warming. Her logic is simple, and chilling in its implications: people produce carbon, thus more people will bring greater carbon emissions while fewer people will bring lower carbon emissions. Extreme environmentalists like Steinem and Rieder would use the power of government to tax having children as a form of population control. 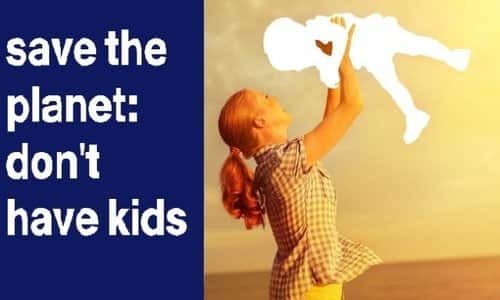 The more money a parent has, the higher the tax, because the greater the children's carbon footprint will be, or so they try to reason. Thus the family itself has become a sin for which we must pay in progressive carbon taxes that increase according to one's income. So goes the liberal agenda.